Two years ago, when we bought this house, we started on the kitchen as our first project. It didn't go quite as fast as anticipated. In fact, after we ripped out the dropped ceiling, painted the walls and the kitchen cabinets, and learned a valuable lesson in the process (never again will we paint cabinets! ), things came to a complete standstill. We replaced the refrigerator and the dishwasher last year but that was about it. Of course there is a downside to having a nice floor, isn't there always? No longer can I just sweep crumbs and such from the counter top onto the floor and call it a day. I actually have to bring the mop out on a regular basis. A small price to pay, I say. Happy weekend! 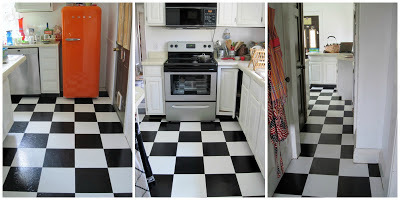 If you could manage to get the darker colored crumbs on the black tiles and the lighter crumbs on the white tiles you might be able to delay getting out the mop. It's so bright and happy looking!